Swords of Scottish design are known as Claymores, derived from the Scottish Gaelic term claidheamh mòr meaning “Great Sword”. In fact the Scottish great sword was somewhat smaller than contemporary swords of similar design, running to about 55 inches overall. Though the Claymore was used from as early as the 1400s, the term was not applied to the sword until the beginning of the 1700s. The Claymore was originally a two-handed sword, with a cross guard that sloped downward, or towards the blade, with four-lobed shapes known as quatrefoils at the ends, and extensions onto the flat sides of the blade known as langets which were designed to lock the sword into the scabbard. The blades were straight and had cutting edges on both sides. Scottish broad sword – From the 1600s onwards, a new type of a Scottish sword was designed and fielded. Much shorter than the two-handed sword, the new sword also had a basket hilt, designed to fit around the bearer’s hand to afford some protection in combat. The new design made the sword a single-handed weapon, and it was most commonly used in conjunction with a round shield known as a targe. The blade could be either single- or double-edged. 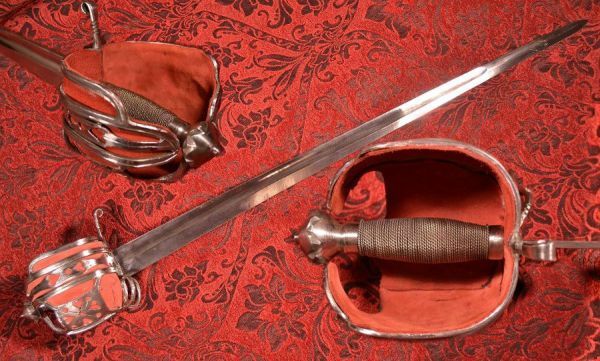 This sword was issued to Scottish soldiers and English officers, and in fact is still worn as a ceremonial weapon by officers of the Royal Regiment of Scotland. The origin of the basket-hilt claymore is contentious, with some commentators theorising descent from the Italian Schiavona, while others draw closer parallels to Germanic prototypes. Scottish Dirk is a cut-down sword blade mounted on a dagger hilt, rather than a knife blade. The claymore (Gaelic: claidheamh mòr) is the best known sword of the Highlands. These swords were so big that they had to be handled with both hands. Although the claymore is a medieval style weapon, it was used until the eighteenth century. A clansman would swing his claymore around the head or in a figure of eight while moving forward, so it soon became famous for taking off heads and other body parts during battle. The basked hilted broadsword (Gaelic: claidheamh leathann) was used by the clans from the sixteenth century, when the use of fire arms made armour and consequently heavy weapons like the claymore obsolete, because it could be wielded with one hand and was more versatile in battle. 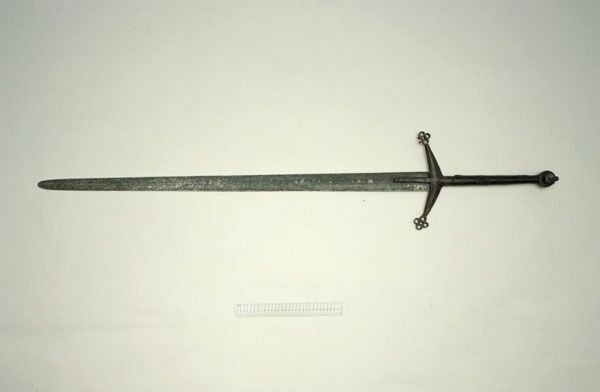 Later on the military were also issued with this style of sword, but this was known as the backsword (claidheamh cùil), as the blade was only sharpened on one side. The Highland dagger worn by the clansmen is known as a dirk (Gaelic: biodag). This was a multipurpose knife that could be used for skinning and breaking through bones of animals (or humans), but it could also be used in battle. The preferred technique was to hold it behind the targe pointing downwards, so the clansman had another cutting edge. The handle of every dirk would be carved by the owner, hence making it unique. The Scottish targe was a round shield with loops on the back through one of which the arm was passed while the other was grasped by the hand. 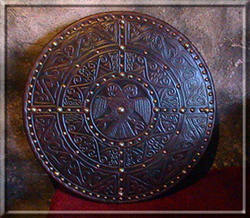 This entry was posted in Swords and tagged Broadsword, Claymore, Dirk, Scottish, Scottish swords, Shields, Targe. Bookmark the permalink.